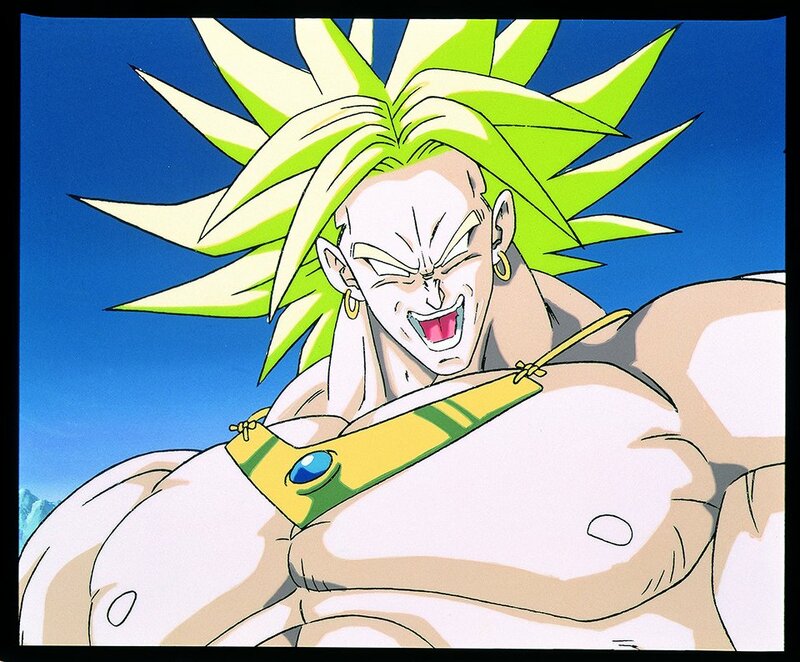 The 8th Dragon Ball Z Movie, Broly: The Legendary Super Saiyan (known in Japan as “Burn Up!! A Red-Hot, Raging, Super-Fierce Fight”… Yep. 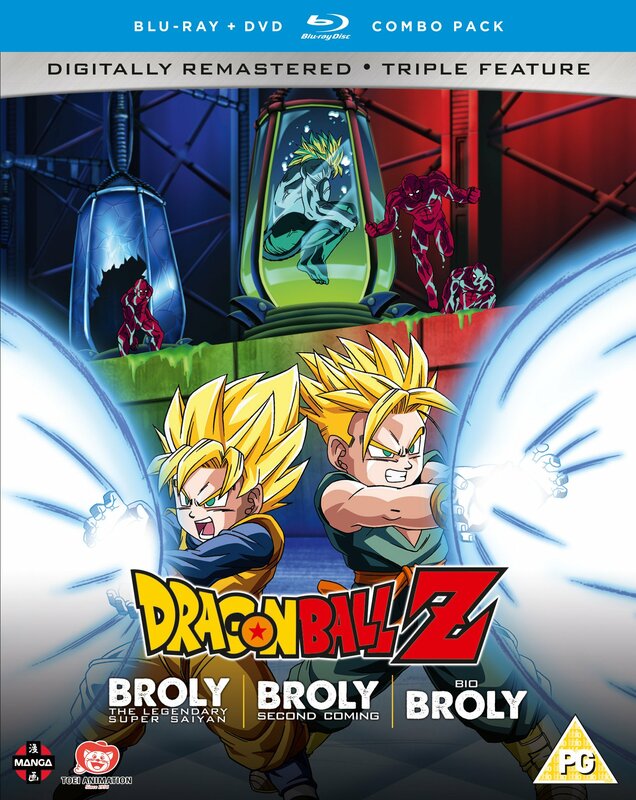 Amazingly not the worst title featuring in today’s review…) was released in March 1993, the same time as Goku and Cell were squaring off in the Cell Games on TV, which means the characters featured here (once again including Future Trunks) have the same powers shown in the Cell Games, minus Super Saiyan 2 for Gohan. It’s also worth noting that this movie is the longest of the first 13 DBZ films at just over an hour, rather than usual 45-50 minutes. The two Saiyans arrive on Earth many, many years later, with Broly under the control of a power-limiting headband, and ask Vegeta (who I guess really should have been called King Vegeta a long time ago…) to return with them to a new Planet Vegeta they have created. The proud Prince of the Saiyans agrees, with Gohan and Trunks (or Prince Trunks, as he’s called!) following him, as well as some comic relief via a drunk Master Roshi, Krillin and Oolong accidentally ending up on the ship. Goku also eventually arrives on the planet as well after being warned about the “Legendary Super Saiyan” that had been destroying planets recently by King Kai. Seeing Kakarot triggers a rage in Broly, somehow recognising him as the baby who was crying next to him on the day they were born, and he transforms into the huge hulking mountain of muscle most people will recognise him as. Goku and the rest of the active cast (including Piccolo, who randomly arrives) actually get trounced by Broly for most of the movie, before the obvious conclusion to the film occurs at the end! 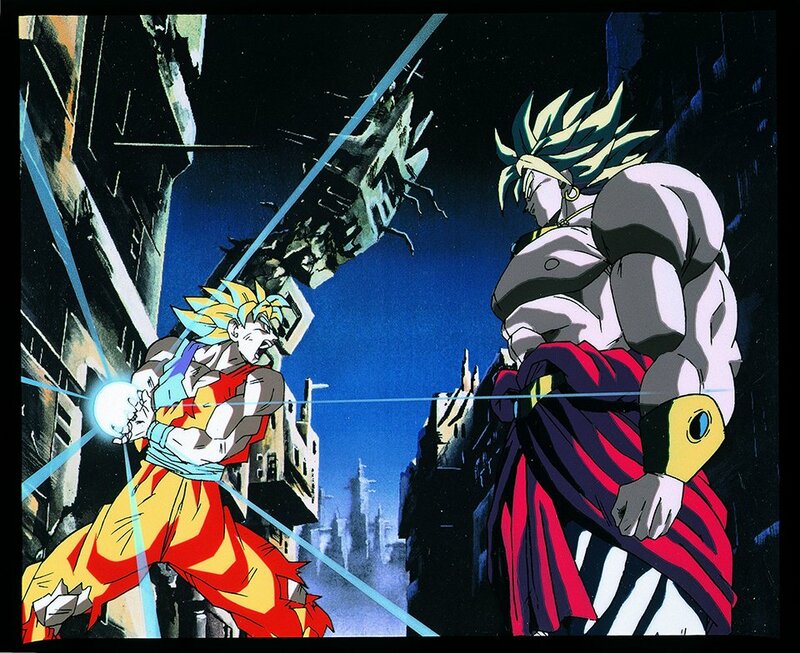 Dragon Ball Z’s 10th movie, “Broly – Second Coming” (known in Japan as “The Dangerous Duo! Super-Warriors Can’t Rest”, still not the worst title in this review…), was released in March 1994, when the World Tournament had just collapsed and everyone was following Babidi back to his ship on TV. That means that, yes, this is the first film set during the “Buu Arc” period of the show, and actually features Goten and Trunks as the lead characters for most of its runtime. It also has Videl and the actually teenage version of Gohan, as well as an amusing Krillin cameo, and barely features Goku at all. The film opens up showing us that Broly survived the destruction of New Planet Vegeta and ended up crashing on Earth, trapped under ice for seven or so years. 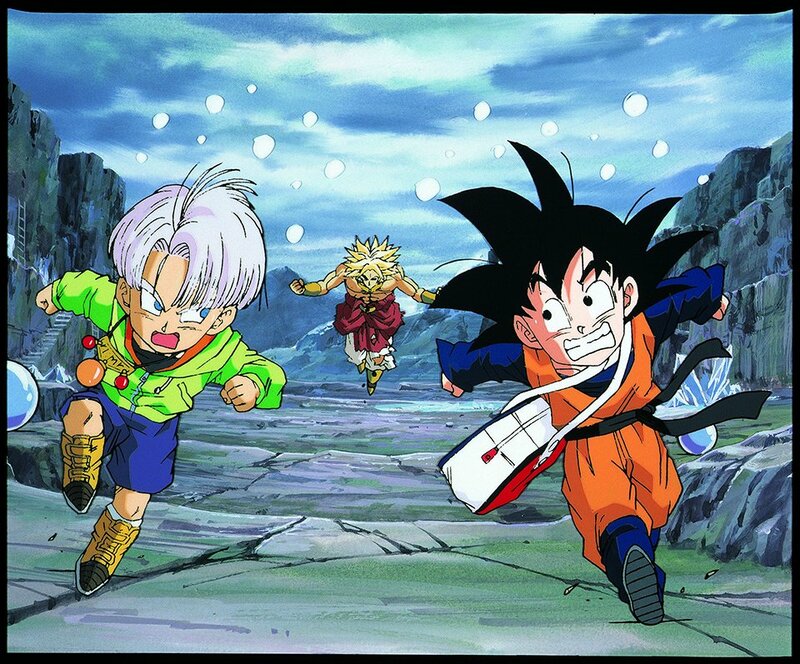 As he wakes up, Goten, Trunks and Videl are hunting Dragon Balls for something to do (the kids have suitably immature wishes in mind, I think Videl is just in it for the experience) and come across a village in the snow that’s cursed by earthquakes. The annoying as hell priest is trying to sacrifice an innocent girl to appease the Gods, an act which, of course, our trio put a stop to. Soon Broly emerging from his icy prison is revealed to be the cause of the quakes and he attacks Goten, mistaking him for Goku. This first half is very much based on early Dragon Ball mischief, with children having a laugh, some silly humour and characters, and two counts of children urinating. Very Toriyama-ish, but given the short runtime, you’ll be glad when Gohan turns up and the fighting takes a more serious turn for the finale. Dragon Ball Z: Movie 11 “Bio-Broly” (known in Japan as “Super-Warrior Defeat!! I’m the One Who’ll Win” Yep, that’s awful alright. Doesn’t even make grammatical sense, yet that is the proper translation! Oh well, “crap and doesn’t make sense” is about right for this movie anyway…) was released in July 1994, the same time as Majin Buu is hatching from his giant egg in the Dragon Ball Z TV series. It once again has Goten and Trunks as the leads, though Android 18 and Mr. Satan are also heavily featured. Beyond a Krillin appearance and a very brief Goku cameo just before the end credits, that’s the entire established cast. It oddly directly references the original storyline, opening with Android 18 wanting her prize money from Mr. Satan after she threw the tournament finale for him, despite the fact that it’s obviously not set in a world where Buu was awakened or Goku returned to life. While Satan is cowering from 18, an old rival of the World Champion by the name of Mr. Jaguar issues a challenge for him to face his special artificial fighters known as Bio-Warriors, otherwise he’ll expose Mr. Satan for wetting his bed while they were at camp (yep…) Mr. Satan accepts and 18 goes along with him to make sure he doesn’t use it as an excuse not to pay up. The duo are joined by Goten and Trunks and they and 18 end up fighting the Bio-Warriors under the pretence of being Mr. Satan’s students. They make short work of them, until the last warrior is released: a clone of Broly! (created from a blood sample collected by that annoying priest from the previous film…) This isn’t actually that bad of an idea for a story if you really must use Broly again, but sadly as soon as Broly emerges from his tank he’s covered in a “culture liquid” that turns him into a bad Swamp-Thing knock-off with pieces of corn sticking out of his head. 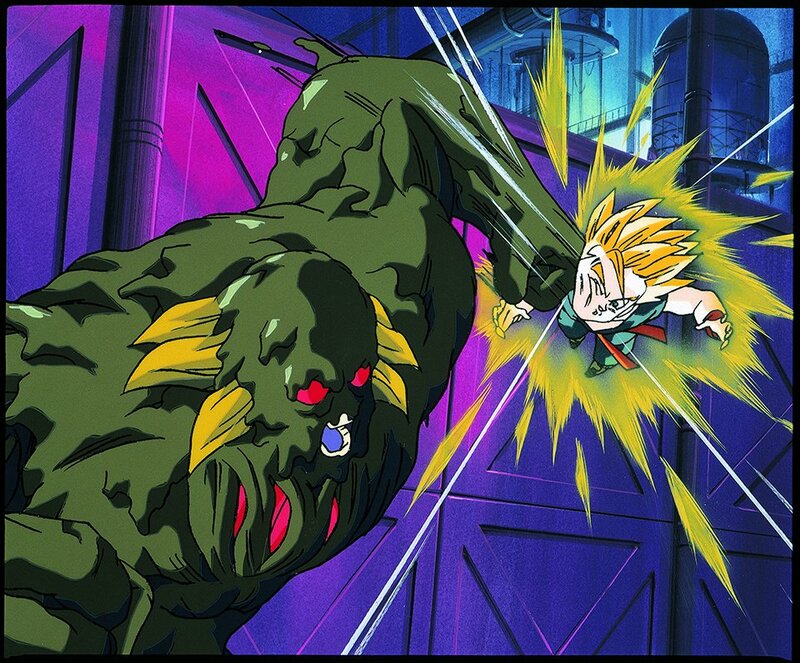 It’s a properly crap monster design made worse by the fact that it’s supposed to be Broly… “Bio-Broly”, as he becomes known, spends the rest of the film wrecking the lab and fighting Goten, Trunks and 18, then later Krillin, blobbing about the place in puke-green sludge. Movie 11 is just not very good, and made worse by having a really anticlimactic ending on top of everything else. If I had to list all 15 DBZ movies, or, hell, all 19 DB movies in general, this would rank bottom. It’s lucky it’s included on a disc with a great movie and an above-average one, otherwise I doubt many would buy this on its own. Once again the release is extras-less, minus some trailers, by the way, which is understandable this time considering this has three films rather than two. So why is Broly so Marmite? Well, although it really comes down to personal taste, Broly is a really entertaining villain in his first appearance, but his poor reimagining in Movie 10 and the awful Bio-Broly means there is more bad Broly out there than good. Ignoring the classic “kids think he’s badass, teens don’t want to think the same way as kids, so think he’s the worst thing ever” side of things (that I remember being a thing back in the early 2000s when all we had was written recaps and 15 second clips!) I think Broly is so divisive because he’s so over-exposed, and in a lot of that exposure he’s just a simple-minded beast, which isn’t very interesting. I honestly think is Movies 10 and 11 features a different antagonist, and Broly didn’t end up appearing in literally every Dragon Ball game in the past 15 years (with the exception of Dragon Ball FighterZ… so far…) he wouldn’t be so Marmite, and he’d probably be thought of more fondly in the general eyes of the fandom. Dragon Ball Z Movie Collection 6 brings together the final two movies from the 1989 – 1995 run of 13 DBZ movies, the two movies that for the longest time were plainly “the final two Dragon Ball movies”. Past villains escaping from Hell, fusion, fart gags, a cartoon interpretation of Hitler and Godzilla parodies are all on offer here, but the big question remains, does this run of 45-minute films end on a high note…?